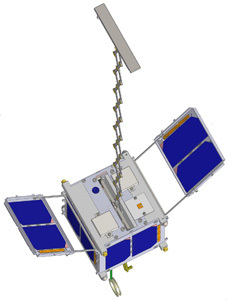 KSAT 2 (Kagoshima Satellite 2, also named Hayato 2) is a small 1U CubeSat mission developed by the Kagoshima University. It is a modified reflight of the failed KSAT (Hayato) satellite. Study on Forecast of Localized Downpour and Tornado - In-orbit experiments of an original observation method of atmospheric water vapor. Take Earth Live Images from Space - Ku-band high-speed data transmission, one shot / a few seconds. Basic Experiments for LEO Positioning Satellites - Frequency and phase synchronization between a ground-base system and a satellite. Orbit Determination Experiments with Radio Interferometer - Essential item for nano-satellite orbiting at very low earth orbit. Satellite Tracking Experiment at Very Low Earth Orbit - Evaluation of Earth's atmosphere to the satellite. Verification of Pantograph-type Extending Boom in Space - The boom was originally designed and is fit for compact satellites. Messages of Encouragement from Space to Japan - Hand-lettered messages and heart warm pictures, especially from children responsible for the future.